The Edmundsburg Castle is much more a villa or big house rather than a castle. The building spans over three floors and is cubic with a small, central dome. It can be spotted easily from about anywhere in the old town, especially the Salzburger Dom. Abbot Edmund Sinnhuber of St. Peter′s Abbey built the Edmundsburg Castle in 1696 and it remained the property of the abbey until 1834. After that, it became the site of a well-known school for boys. Until 2008, the Edmundsburg Castle held some offices and a private library of a foundation. 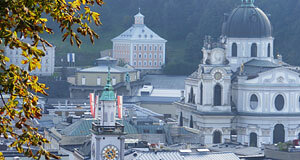 In 2008, it was let on a long-term-lease to the University of Salzburg and extensively renovated. Since then, the Edmundsburg looks all nice and shiny again and due to its prominent location right at the foot of the fortress hill, it makes the university′s most attractive institute. It deals with International and European studies. It is not open to the public, which isn′t too bad, as there are plenty of more significant attractions all over the place around it. However, it is worth going up to the building just for the view over Salzburg: go up the staircase on the Toscaninihof next to the Small Festival Hall, it will take you directly to the castle.